Lily's nursery was inspired by my love of the cottage style. I couldn't wait to piece together my daughter's nursery. It was all purchased separately and I found many of the items to coordinate on eBay. My husband and I had been married almost 12 years when we found out we were expecting a baby girl. We thought we would never have a baby, so she was truly a blessing. Pale pink walls - We painted with Benjamin Moore pale pink. We went simple with two coats of a soft pale pink, accented with 2 coats of white paint on our closet doors. A beautiful antique dresser we had found at an estate sale, my husband restored it. Graco Victoria white crib with scrolling. 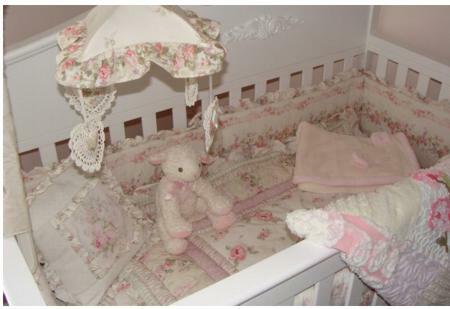 Kidsline Bellissima rose bedding and mobile - very cottage looking with pink roses. 2 gorgeous handmade chenille bedspread quilts, one of which was lovingly handmade by a special friend and the other from a well known chenille artist. A handmade chenille bedspread pillow. A handmade cameo rose pillow accented by chenille. 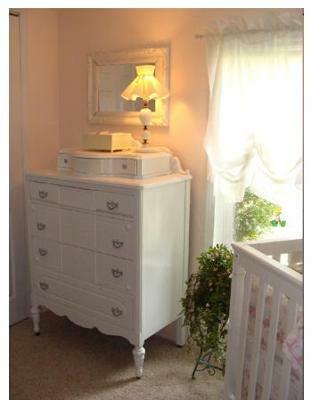 South Shore white changing table with little cubby holes for white wicker baskets, accented by an antique scroll white mirror above her dresser. 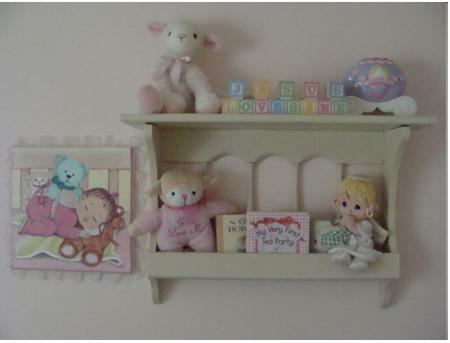 Wendy Bellissimo prints including "Baby Love" and "Bunny"
2 shabby cottage style shelves one with a Wendy Bellissimo bunny wall clock, a pretty picture frame with pale pink roses, a little stuffed bunny and a beautiful hand painted portrait of Lily near her crib that was painted special from her auntie, the other with a stuffed lamb, little blocks that read "Jesus Loves Me", a cinderella stage coach bank, a stuffed lamb that sings "Jesus loves me", 3 little books and a precious moments angel given to Lily. Wicker basket with her stuffed animals. We put new carpet in and ruffled white curtains. It took me 2 weeks to find everything, mostly online and about a week to get the room ready. It was fun and very exciting. My favorite part was sitting in her room before she was born and looking around... just imagining holding my baby girl! 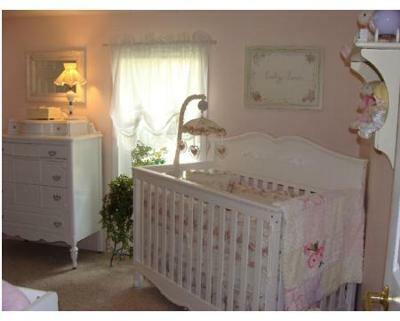 I love how peaceful and pretty the nursery is. My very favorite is her antique dresser that my husband restored for her, not only is it so beautiful, but it took him 15 hours to do and a lot of love. He just couldn't wait to have his little girl. I also love her beautiful white crib with floral scrolling. The whole room is so inviting and warm. The room came together perfectly to create a wonderful little girl's room. i think its the most beautiful nursery I have seen in my life!! I really love the dresser that my brother made for my niece. When something is made by your daddy for you, it will be the best thing and feeling that you will ever have Lily!!! Papa made stuff for me when I was little and so did Nana. I love them very much! Your mommy and daddy did such a wonderful job on your room, I love it so much! Cottage chic it sure is, Gorgeous room for a baby girl for sure! I am Lily's Nana and Lily's mommy and daddy did the best job ever with her nursery. 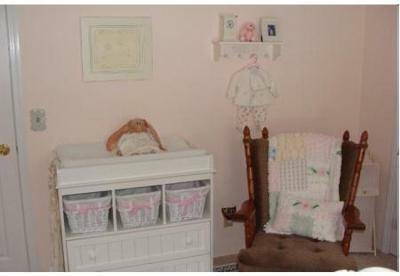 They put a lot of thought and a lot of love in everything that was chosen for her nursery. My favorite furniture piece is her antique dresser that her daddy refinished. The chenille quilts and bedding add an extra special touch. It's very hard for Nana and Papa to leave when we visit, but we like to know she is all bathed and tucked in her beautiful crib with the adorable mobile that hangs above and plays lillies and roses. It's just the ending to a perfect day with our little Lily. Debbie is my cousin. I have 8 beautiful grandchildren myself, but I have to say Lily has the most beautiful baby girl nursery I have ever seen! !I have seen many pics in magazines, but I think Lily has the best. 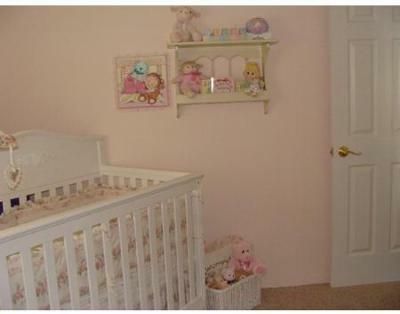 Her mommy and daddy put a lot of thought and work into the nursery,and it is just beautiful. Thanks for sharing Lily's nursery - it's gorgeous! I love the bedding. Congratulations on your little one! I am Lily's auntie Dana and even though I saw pictures of her nursery via email, it was nothing compared to seeing it in person! What a beautiful job Debbie did on this room! She has excellent taste and a knack for finding exactly the right pieces! The room looks as if it came straight out of a magazine! I am a mother of two daughters, one of which is 1 1/2 years old now. I decorated her nursery myself as well and painted several murals on her walls. I wanted to give Lily something special that she could treasure always. I am so glad that the portrait I painted is hanging in her gorgeous room! Is there anything more fun then decorating for a little one?? No!